Pick up at the airport and transfer to the hotel for check in. Around 17.00, our local tour guide will pick you up and take you on a walking tour to learn more about Hanoi culture, history and cuisine. Your trip to Vietnam is incomplete without an eating out experience on the streets and this trip is for you to eat just like a local. Chances for you to taste and sample many side dishes of Hanoi from spring roll to noodles, from grilled meat balls to BBQ bread… Overnight in Hanoi. 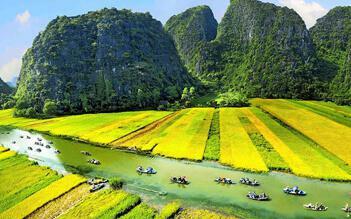 An excursion to Ninh Binh province, 90km from Hanoi to visit Hoa Lu ancient capital of Vietnam and Tam Coc grotto. After a buffet lunch at the restaurant, get on a sampan to enjoy the beauty of the karst formations as you pass along their base and row into one of the many caves carved through the limestone in Tam Coc - Bich Dong. 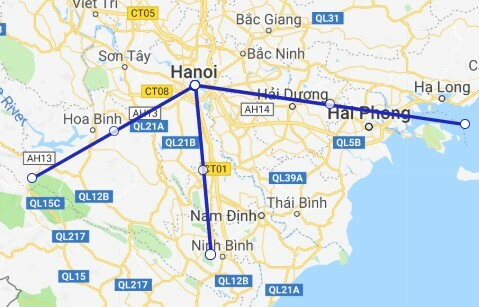 Dive back to Hanoi and drop off at the hotel. Free time at your leisure and overnight. 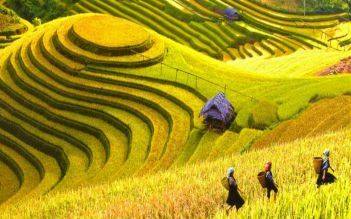 Enjoy the second day with an exciting trip to the northwest of Vietnam to visit Mai Chau. 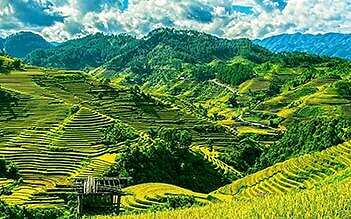 Upon arrival, you will have chance to see the house on stilts of the ethnic minorities living here, enjoy the great view from the house on stilts with green fields, green valleys and blue sky as well as having a warm and cozy lunch prepared by the women in the homestay. After that, ride a bike to visit remote villages in the valley and learn more about their daily life and how they make their living. Dinner and join a dancing show with the locals and drinking Can wine then stay the night at the night at the homestay (or bungalow upon request). After breakfast at the homestay, join in a group for a hiking trip to explore 1000 step cave and a local market in Mai Chau. Have some times for your own visit before heading back to Hanoi. Free time and overnight at hotel. Morning: Pick up from your hotel and transfer to Halong. Upon arrival, you will get on the boat where your trip begins will a delicious lunch. After that, you will have time to visit Heaven Palace cave – one of the most beautiful caves in Halong bay and then, a kayaking trip or bamboo boat trip to explore many different karst-formation islets around a floating village. Great trip. Don't feel daunted by the bike ride, it's broken into manageable chunks and was one of the best chances to see amazing scenery. Great trip for those that want to experience nature, meet people, and keep busy. Long bus rides between places was the only drawback. Awesome travel!! We had a 6-day travel in north of vietnam and everything was amazing. Our travel guide did everything for us that.s why our travel was hassle free... definitely highly recommended! Our family of 5 persons traveling within a package tour by this company. Our Chinese speaking tour guide was perfect. She could speak very good Chinese and very helpful. We were happy with their service and recommend them highly.